I’m a huge fan of the popular genre trend called “Metroidvania” and I have no clue how I hadn’t played a Shantae title until now. 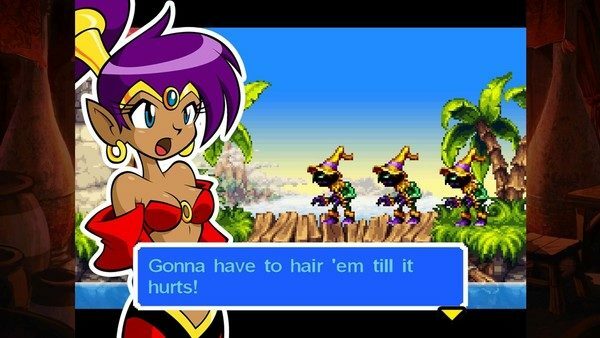 It was a title always on my radar but ever since the talent people over at WayFoward released Shantae’s first adventure on the GameBoy Color, I’d just never got the opportunity to pick up and play a title in the series. When the remake of the DsiWare title Shantae: Risky’s Revenge came into my mailbox in the form of a review I was like the N64 kid just foaming at the mouth to get home and enter the 12 digit code into my PlayStation 4. Now the moment you’ve been waiting for, did the classic action/adventure title meet my expectations or disappoint? Like I said earlier, this was my first trip to Sequin Land (Shantae’s world) where you take control of the half-genie, who uses her hair and whips it towards enemies as her main attack. I didn’t feel like I was missing out on anything story wise by jumping into the second game of the franchise. 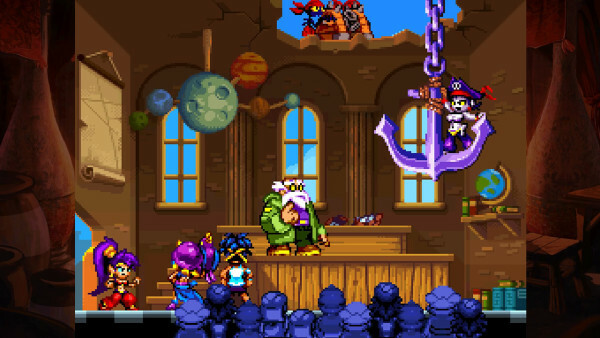 You quickly learn through some cut scenes (with some beautiful artwork, I might add) that your nemesis the pirate Risky Boots is back to steal a genie lamp that was on display at the expo and to get… ugh revenge on you. This is all told through 16-bit side scrolling goodness, but the characters pop out with high definition models during the dialogue that look absolutely stunning. 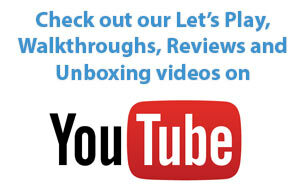 I’m glad to tell you that the gameplay completely lived up to my expectations and more. While your main attack is your hair whip, there are various other attacks you can get via the in-game store. As you wander around Sequin Land defeating enemies and doing your best Link impersonation destroying pots, you will earn jewels which can in turn be used to purchase secondary attacks and aid items such as a protecting ball and a fireball you can shoot out. These moves are easily performed with the shoulder button and use some of your magic gauge. You can also use the other shoulder button to do a quick back dodge slide. 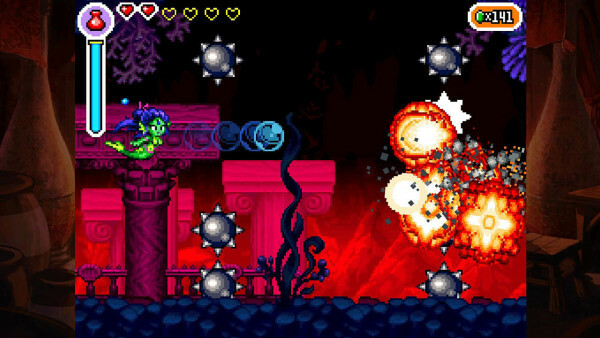 One of the cooler features in Shantae: Risky’s Revenge is that you can transform into different forms after you earn them by belly dancing. These transformations will help you discover and explore new areas. An example is when you get the monkey form you can climb walls and when you get the mermaid form you can then swim. This is a really clever way to hinder your progress and limit you to an area until you earn something to move you to the next area. It feels more like a natural progression and less backtracking. During my normal pre-play research I read that the map system was a huge negative in the early releases of this title. In the PlayStation 4 version the map works very well as you are able to transport between statues that you come across and awake throughout your journey. In the updated version you can also change the screen size to better suit the clarity of the game. The best look is the original version but this leaves letterbox-like lines on the screen so I always choose to blow it up to full screen which lowered the picture quality slightly. There was even an original DsiWare size but that was super duper small even on my 60′ television and was basically unplayable. Like I said the graphics are those that are comparable to what a 2D adventure would have looked like on the DSiWare nothing more and nothing less. The hand drawn look of the characters on the dialogue screens are jaw dropping gorgeous in comparison. The soundtrack also is great just like the 16-bit counterparts that it aims to emulated. It has a very Capcom feel in the music with such of their classic titles such as Mega Man and Duck Tales. Even if you have never played a Shantae title like I hadn’t, don’t fret as you will feel right at home once you jump into the title. I would have liked to see some better improvements over the DSiWare title mainly in the graphical sense, but it isn’t a deal breaker by any means. I plan to go purchase the Game Boy Color original and the Wii U follow up now from having played this title, an easy recommendation to 16-bit fans.